As a parent, you’ll already have your hands full when it comes to looking after your little ones, so you might be a bit skeptical about the idea of introducing a pet into your busy family life. But, if you can see past the minor inconveniences such as occasional visits to the vets or cleaning out a smelly litter box, there are several great reasons why adding a domestic cat to your household can be great for the whole family. 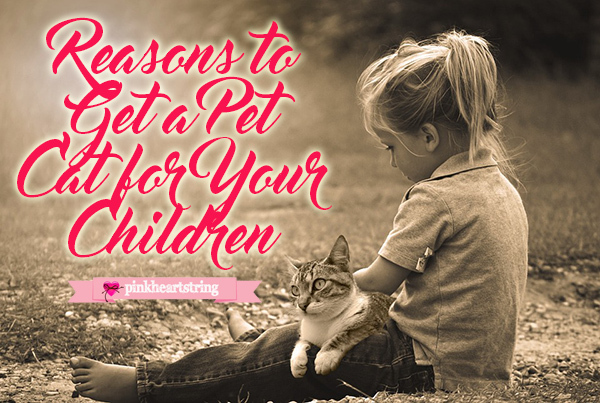 A pet cat can have numerous benefits for your little ones, including health benefits, helping them with social skills, and of course simply providing a new best friend. We’ve listed some of the main reasons why getting a pet cat could be the perfect decision for your family. Family life can be a lot of fun, but even happy families sometimes get stressed and worn out. Maybe you’re having a hard time at work, your little ones are finding school work difficult, or other problems such as illnesses can creep in and bring stress to your family life. Having a pet cat at home can help to reduce stress levels for all the family; whether it’s being distracted with their funny antics after a long day at work or cuddling up to them when you’re not feeling well. Numerous studies have shown that cat owners are less likely to be stressed than those who own other pets or have no pets at all. And, the vibration of a cat’s purrs are very therapeutic; they can help to relieve stress and even help to heal the infection. Whilst you might be worried that bringing a cat into the home could cause an allergic reaction for your child, the good news is that if your child does not already have a cat allergy, the new pet could actually help to prevent them from developing a range of allergies throughout their life. According to the American Humane Association, studies have shown that babies born into families where cats were present beforehand actually have a reduced risk of developing allergies later in life. In addition, children who are brought up around cats and exposed to them during their early life are also less likely to develop asthma. Although cats are very independent animals which makes them the perfect pet for a busy family, looking after one is also a very big responsibility. Yes, you may be able to let your cat out in the day where it can explore and roam freely, however taking care of a cat means that you are committed to feeding them daily, making sure that they have enough water, keeping their litter box clean and tidy, and ensuring that they are regularly given flea and worm prevention medication. Allowing your children to help with the regular care of their pet cat can be a great way to help teach them how to be more responsible and understand the importance of this. See Cats PhD for more information on looking after your family cat. Since many cats tend to be quite shy and wary, they can be the perfect pet when it comes to teaching your child about good social interaction and being patient. For example, your little one will quickly learn that she needs to approach the cat calmly and speak to it in a gentle, friendly tone so as not to scare it away. Along with this, many cats will only come out and play with a human when they feel completely relaxed and comfortable around them, which will teach your child the importance of being patient and making sure not to rush things. Although they’ll be learning this with a cat, it can be a vital lesson which will help them with their interactions with other humans throughout their childhood and even into adult life. Having a pet at home is a wonderful way to encourage your child to learn more about animals, which could then be very helpful to them when it comes to school work! Having a pet cat is a great way to explain to your child the differences between different animals, or even how certain species of animals are closely related to each other – you could compare your cat to a lion or a tiger, and note how they are similar in some ways, but not others. Taking care of a cat can be a wonderful way to help your child learn more about the differences between humans and animals; such as how cats are able to keep themselves clean without using water, why their tails are so important for balancing, or how they use their whiskers to help them get around. Any parent wants their child to grow up to be a compassionate, kind and empathetic adult – teaching them this at a young age is key! When it comes to learning about empathy and respect for others, a cat can be a perfect teacher – most cats aren’t afraid to let you know when they need their space, for example, some will gently push your hand away with their paw when they are done being petted. 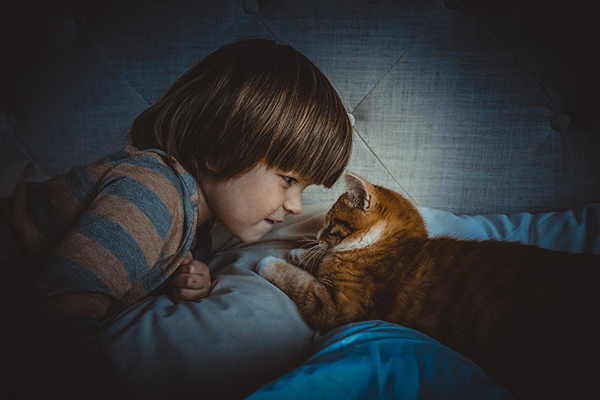 A cat can help your little one learn more about respecting and caring for others; your child will learn to understand your cat’s needs and wishes, and quickly realize that he has to respect them. Last but not least, a pet cat at home can be a lot of fun and entertainment for the whole family. Although many cats are not as interactive as dogs or other pets when it comes to their humans, this doesn’t mean that they can’t provide a source of joy and happiness for their owners. There’s a reason why there are so many cat videos online with millions of views – some of the things that cats get up to are purely hilarious and are sure to put a big smile on everybody’s face. Would you like to add any reasons of your own? We’d love to hear from you in the comments.